The Central Bureau of Direct Taxes (CDBT) today in a surprise circular said that those having income below Rs.5,00,000.00 will also have to file returns for the Financial year 2012-13 for the year ending 31.03.2013. The article appeared in Times of India, Mumbai edition today which you can read here. This is a very surprise move because for the earlier two AYs 2011-12 and AY 2012-13, the Income Tax department had exempted those who were earning less then Rs.5.00 lakhs from filing any returns. However with just 8 days remaining for the deadline, Income Tax department is expected to extend the deadline in lieu of rush on the above order. I have already give a tutorial for e-filing Income Tax returns offline which you can refer to here.Today I am giving a tutorial for step by step guide for e-Filing the Income Tax Returns for A.Y. 2013-14 online. This method is easier then the offline method and can be used if you are salaried employee. 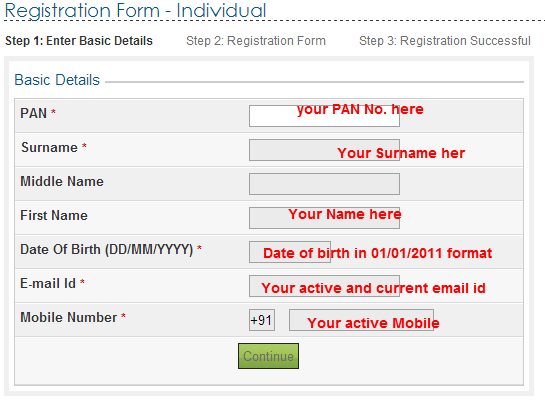 Do remember to keep your PAN Card Number, Form 16 and Bank A/C details ready for proceeding with it. 1. Go to the Income Tax departments e-filing site here. Register yourself as per below pic. Remember to give a proper password. From here you will be led to this page. You can see that it has six fields at the top and submit, save draft and exit at the bottom. Press Save Draft and proceed to INCOME DETAILS field. Enter your income details in this Page and the deductions under Chapter VI A as given in your Form 16. In the Taxes Paid and Verification, the taxes if already deducted will appear automatically. Refunds due if any will also show up in this field. 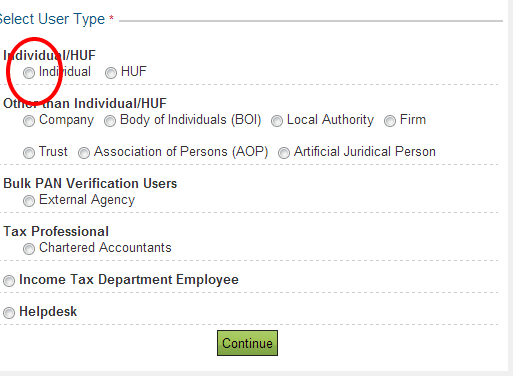 In the Bank details field on this page fill in the proper bank details including the IFSC code. You can check the IFSC code from your Chequebook, Pass book or here(this is a lengthy process) The IFSC code is a 11 letter code which always starts with the bank name for example State Bank of India code always starts with SBIN. Once you have filled the details correctly press the submit button at the bottom of your page. The website will ask you to confirm whether the details are correct. Press yes and there it is done! 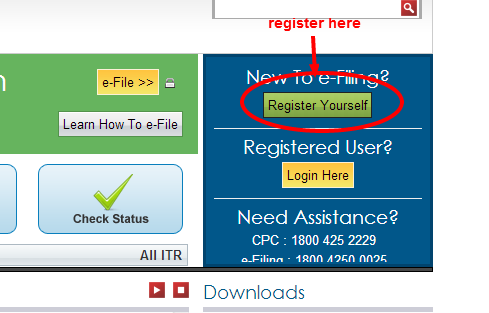 The page will show you ITR V which can be downloaded. You will also receive a copy of the ITR V in the email id you have given on the Personal Information page(not in your registration id). This is a far easier method but requires little patience and diligence. Remember by paying your taxes and filing your returns, you not only take part in nation building but you also save your valuable time and resources. Very very useful. Thanks 4 saving my money. Thanks for sharing Vijay..I also have go for I-Returns now.. Without filling income details I submitted. As I got filled all the TDS Details from PAN Card, I submitted the form. What Can I do now? How to resubmit now? Please guide me to proceed. I selected a wrong assessment year..is there a way to fill it again? No Sathya as of now no update on extension but I think it will be extended due to the fact that itax site was down yesterday due to bandwidth overload. Can he file now, if yes let us know the process to file income tax for AY 2012-2013 now. Again the time has come when you have to assess your total income and file the income tax return. The last date for filing the income tax return is 31.7.2014. Please file it before the due date so as to avoid penalty and interest. My Tax refund for the year 2013 - 14 was rejected due to wrong Bank details updated while filing return. 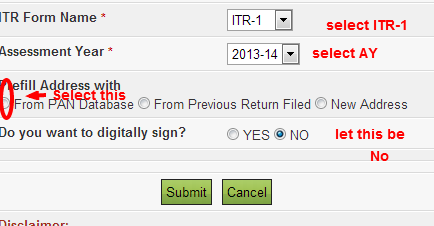 Swapnali there is a rectification button or you can fill a revised return for the year 2013-14 giving correct details. today 17/10/2015 and i fill return a.y.2013-14 on 14/10/2015, but some mistake i wish to revised it, so this is REVISED ?? PLS. TELL ME FURDHER DETAILS !